My little sister just celebrated her birthday, and since we'd had a particularly cold and rainy summer so far, I decided to make her a "Rosy-Cozy Survivalkit for Cold Summernights" . 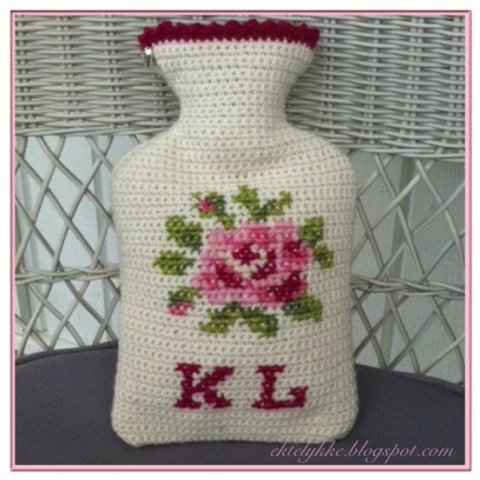 Inspired by the lovely Coco Rose and her amazing photos and tutorial of her hotwater bottle cover, I made this Cath Kidston inspired version. 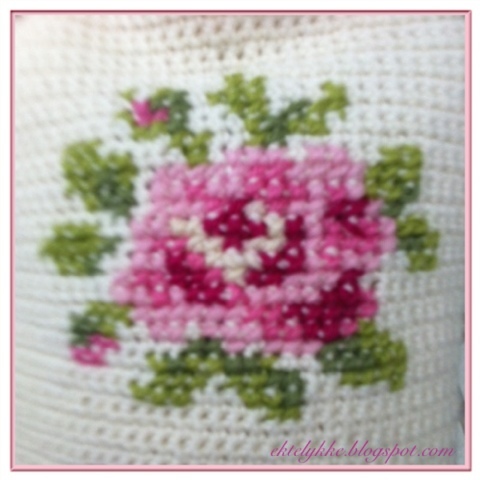 The "Provence-rose" (from Cath Kidstons book "Stich" ), and my sisters initials, are embroidered in cross-stiches on the crochet cover. I like the vintage look and the colourcombo so much! .... and a lovely rose for the backside as well! 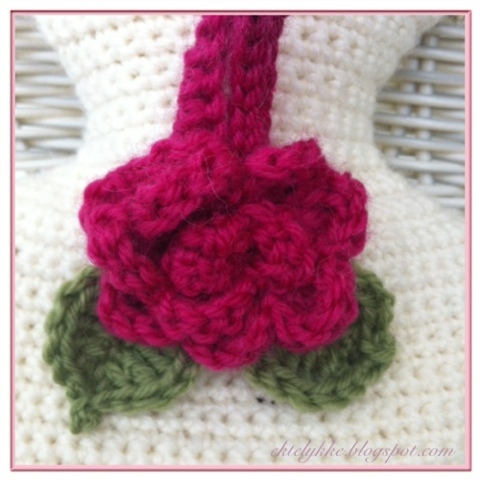 This lovely rose is made from this great tutorial from the amazing Lucy in Attic24. These roses are so pretty and so easy to make - and they turned out to be quite addictive....I have lost count of how many I've made so far in all types of yarn. Perfect for my huge stach of scrap yarn. 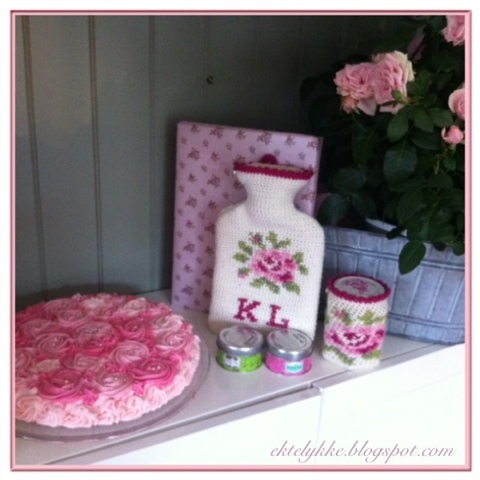 I also made a jar-cosy in the same pattern, and filled the jar with pink marshmallows. So sweet and soft! 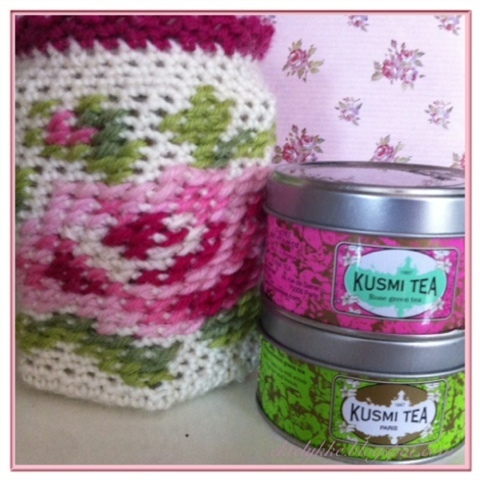 Some wonderful Kusmi teas are also included in the kit! So, here it is! 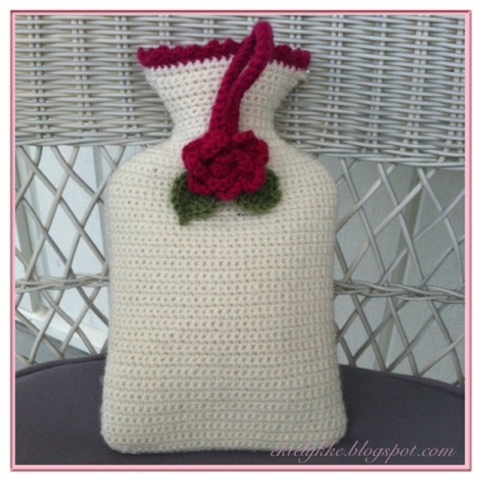 The Rosy-Cozy Survivalkit, complete with a beautiful rosebush and a good book to read, while snuggling the hot-water bottle, chewing on marshmallows and sipping tea! I'm very happy with the result, and have now stacked up my little "studio" with hotwater bottles (found some lovely, big ones on sale!!) to make for my whole family. I have so many colours and patterns all ready in my head, so I'm really eager to try them out! 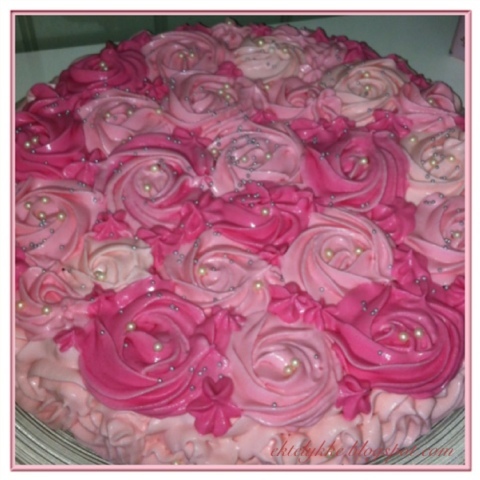 Labels: Cakes, Crochet, Embroidery, Gifts, Tah-da! I have been inspired by your beautiful Christmas blanket, I think I might have found the colours I have been looking for! I am SO excited! 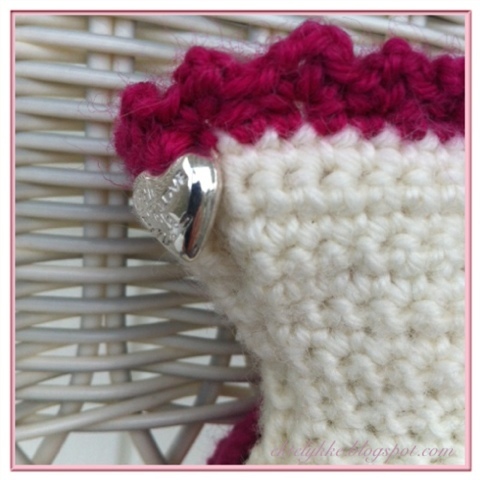 Crochet might be turning into my first love!! !